In 2012 we caught up with the former Delirious frontman to talk about his book, new album with Jesus Culture and life after Christian music's most well-known worship band. His new 2018 album Love Song For A City can be pre-ordered today. It’s going great actually, I feel very at peace about everything. It’s been an amazing three years, I’ve been at home more than ever and involved in church stuff which is great. I’ve written lots of new songs so I’ve been really pleased about that. Stu G and Jon are in Nashville. Tim is running the Big Church Day Out and that’s going great. Stew is running his own graphic design business. Everybody is on their own path and happy and doing great. What are your memories, looking back? So many amazing memories. We got to travel the world together playing in so many different environments from big Hillsong conferences to Bon Jovi gigs. We covered a lot of ground and there’s a lot of grace involved. God blessed it. I’m incredibly grateful for those times. I look back with fondness and realise it’s amazing that God used us in that way. Incredible really. Tell us about the new EPs. I’ve just finished EP3 yesterday. That’s going to be released on 1st October as a download on my website. I don’t know when the fourth one is going to come out yet. I’m trying to partner with someone to get the music out a bit more. I’m in those kind of conversations at the moment. I’m really pleased with the way they’ve come out. There’s a lot of energy and spirit behind them. I’ve started where I am and it’s an honest reflection of where I’m at. Have you been mentoring and helping raise up young worship leaders? I don’t think it’s an academic process or something official but I love hanging out with people who are making music whatever age they are. There’s some people in Brighton where we are right now. I’m enjoying being a part of seeing them grow in music and worship leading. Equally I’m getting more back than I’m giving out which is great. I don’t have any regrets about what I wrote in the book. I’m not anti any of that stuff, I’ve got a lot of friends in that industry. Great people with a great heart so there’s no axe to grind but I think that as a leader you have a responsibility to point out some of the pitfalls to watch out for another generation coming through. The concept of writing a spiritual song for financial gain is an oxymoron. The two don’t sit together. It doesn’t mean you can’t have a songwriting craft, of course you can and if a money is a by-product of that it’s a fantastic blessing. As soon as you create a model and an industry, another generation thinks 'oh great I can do the same and this can be a great way of earning money or a career even'. That’s where the boundary is I think. People can be critical of worship songs and say the lyrics aren’t Biblical enough and the music isn’t creative enough. Do they have a point? I think people have a point in their opinions. We don’t have to agree with them all the time. When you sing a song on a Sunday morning I think it has to be simple enough for people to sing along. These songs are written for people to sing to God they are not written for Grammy awards and to blow people away artistically. It’s a tool to help people connect with God. It’s a very different process to being a pop artist where your sole aim is to impress people with the quality of your creativity. The role of the worship leader and of the worship songwriter is to provide ways of helping people to connect with God. I agree some of the songs we sing aren’t that creative. In time we’ll improve but it is what it is. You have to keep trying to get better, don’t you? Find new ways of saying things with creative lyrics. Another generation coming on will break the mould and present it in a brand new way and we’ll all go 'wow that’s so fresh!' Bring it on, that’s what I say. I hear that’s coming out in November. I went to New York for the week and was part of the conference Jesus Culture were running. I was guested on stage with them and they were cool with that. I’m very excited about that. It’s been an honour to be a part of. Lion the Witch and the Wardrobe. The gospel is supposed to be simple for everyone to understand. I think that book does it brilliantly. That’s a great question. I think helping me to let go and relinquish control. So I don’t always have to know what’s coming next and be a little bit more patient and trust that God knows what’s happening. Not continually trying to make things work or fix them but trust him and let him have control. Finally, I know you’re fed up of hearing this question. 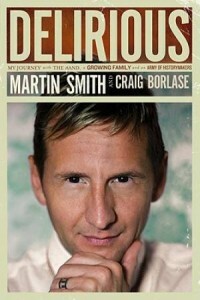 But I have to ask it…Are there any chances of Delirious getting back together? [laughs] You can’t ever rule anything out can you. We’re all still friends. I can’t see that in the near future but there’s always a chance it could happen so watch this space! New to 2018, Love Song for a City by Martin Smith is due for release on the 6th of July. Thank you for the article, Sam. Its always great to hear what Martin and the D:boys are up to. For those of you that dont know, Stu G is part of One Sonic Society, whose cd "Forever Reign" is one of my two favorite releases of 2012. Powerful worship, check it out. I enjoy his honesty. It's good to see someone step away from the machine and observe it's blessings and pitfalls. It reminds me of others I have known in the same predicament within the Christian music scene. I agree with ScottsQuest - One Sonic Society has done an excellent job of continuing on similarly. They will appeal to Delirious fans but exist in their own stratosphere, with a different quality to them.